SALT LAKE CITY – Gov. Gary Herbert, surrounded by members of the Legislature, the LGBT community, and clergy, signed Senate Bill 296, the Antidiscrimination and Religious Freedoms Amendments, into law in a short signing ceremony Thursday night. “It is a historic occasion,” Herbert said as he stood poised to sign SB 296 at a table centered in the rotunda of the Capitol Building shortly after 6 p.m. The rotunda was packed with those anxious to see the bill made official law. With the signing of the bill, Utah becomes the 19th state to provide protections for lesbian, gay, bisexual and transgender individuals in housing and employment, according to the Humans Rights Campaign. The new law also extends protections to freedom of religious expression in the workplace. Read more about Senate Bill 296 and what is does here. The bill came as a collaboration between members of the Legislature, LGBT rights advocates, and The Church of Jesus Christ of Latter-day Saints. 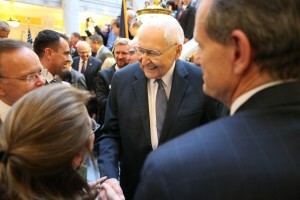 Representing the LDS Church at Thursday’s signing was Elder L. Tom Perry, one of the church’s apostles. Also at the table with Herbert and other government officials was Sen. Steve Urquhart, R-St. George, who has sponsored LGBT nondiscrimination housing and employment protections bills since 2012. This year has seen his efforts come to fruition and made statewide law. “One question: How cool is this?” he said to the crowd, adding he would keep his remarks short. “It’s time to sign the bill,” he said. After the governor and others sat at the table and the signing took place, the crowd erupted into cheers and applause. Rep. Brad Dee, R-Odgen, the House sponsor of the bill, said it was a momentous occasion. “Love can conquer any bias,” he said. “This is some of the best legislation to come from this building,” Senate President Wayne Niederhauser, R-Sandy, said. This is a monumental day for Utah. This vote proves that protections for gay and transgender people in housing and the workplace can gracefully coexist with the rights of people of faith. One does not exist at the expense of the other. 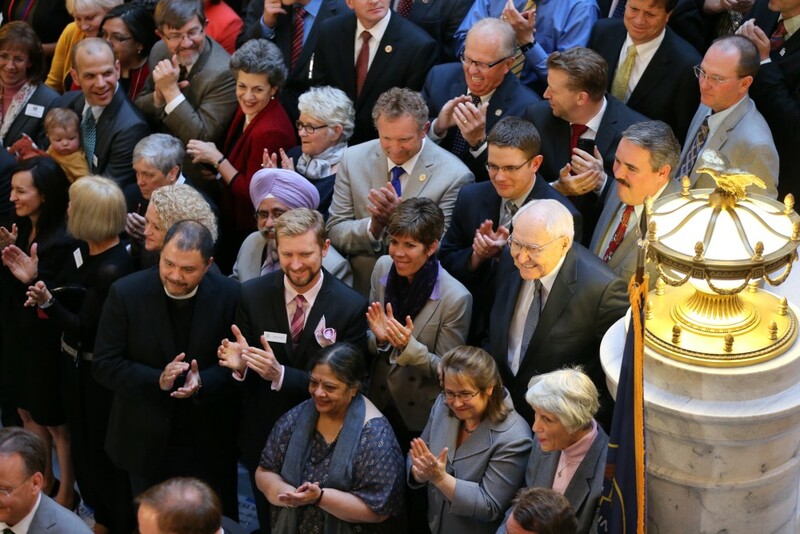 The unprecedented spirit of collaboration – even when it was not easy – between Republicans and Democrats, gay people and straight, religious and non-religious was necessary to craft a bill that benefits all Utahns. This is the third year that Senator Steve Urquhart has run this type of legislation, amending Utah’s nondiscrimination statute to include sexual orientation and gender identity, and the seventh year that Equality Utah has been involved in this type of legislation. For the first time in Utah history, gay and transgender people are now protected at work and at home, in every city and in every county of our beautiful state. I share my deepest gratitude for all those who over the years and over these last 45 days made this moment possible. This is a moment to celebrate. We are pleased that the Utah Legislature has passed Senate Bill 296. It reflects the very best of collaboration and statesmanship from groups and individuals who may not always agree on all things but who have passed landmark legislation that balances religious freedom and antidiscrimination. While other states may find a different solution, we hope this fair, balanced approach shows that fairness for all is possible. The Church applauds the efforts of the Utah Legislature and other members of the community for this historic accomplishment. Ed. Note: Additional comments from Gov. Gary Herbert added in the body of the text.